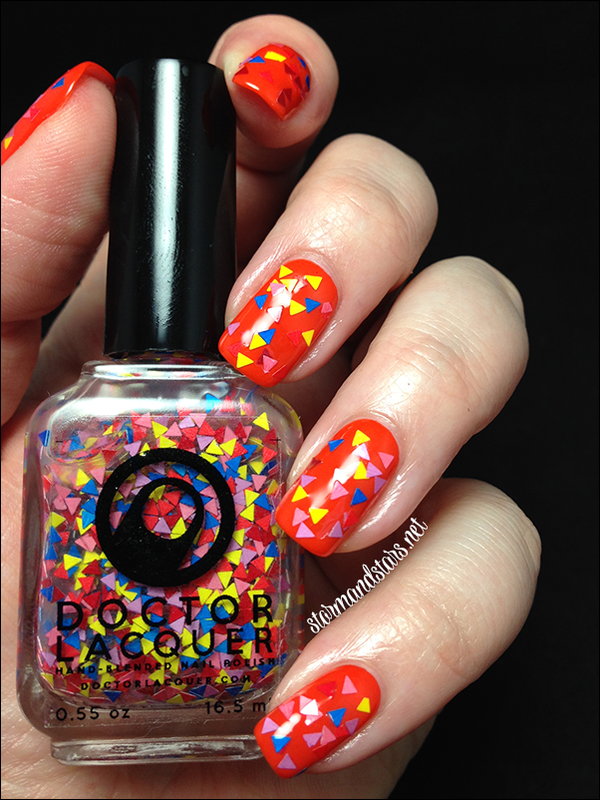 I've got some great polish for you today from Angelyn over at Doctor Lacquer. 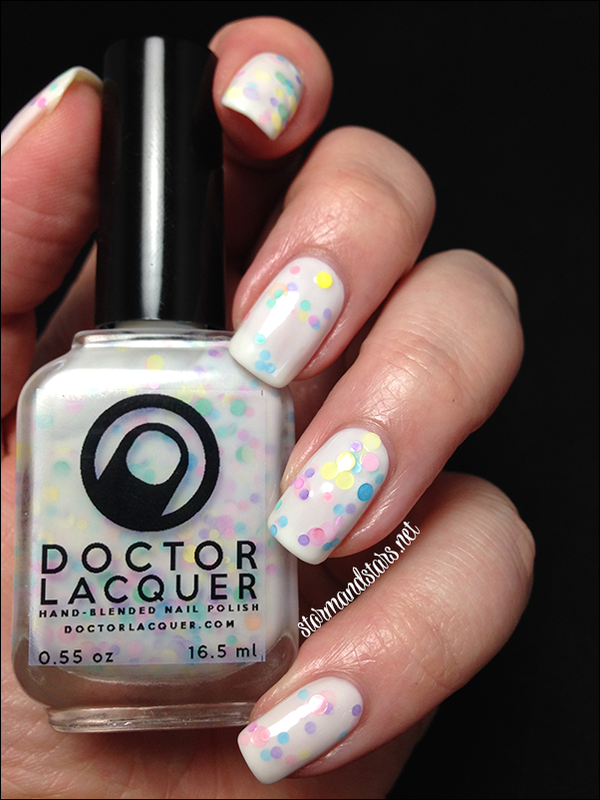 The spring lacquers from Doctor Lacquer is a pair of duos and they are beautiful! 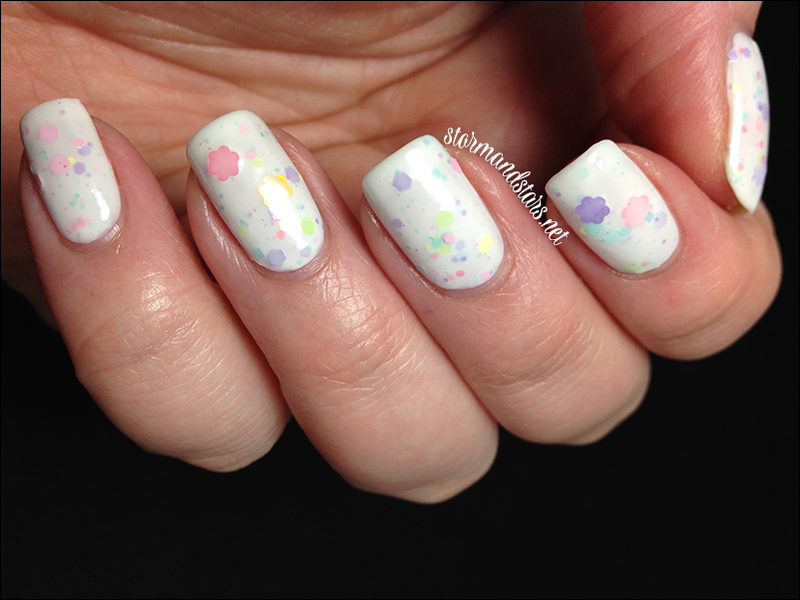 The first duo is the Pastel Duo which is two white crelly based lacquers and the other duo is the Tri Duo which is two glitter toppers loaded with triangle glitter. I'm going to start with the Pastel Duo duo. First up is I'm Lavender Rain. 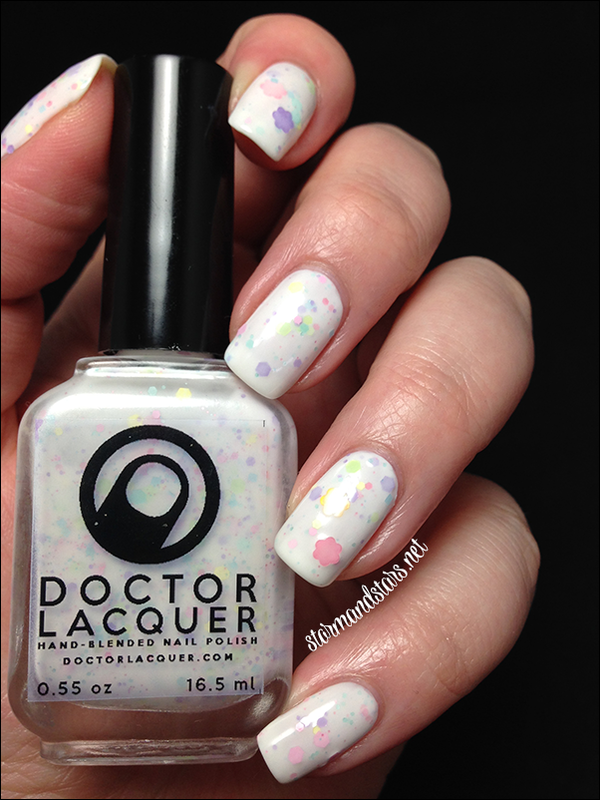 I'm Lavender Rain is a white crelly based lacquer with different sized round glitter in pastel shades. I really love both the look and the name of this polish. 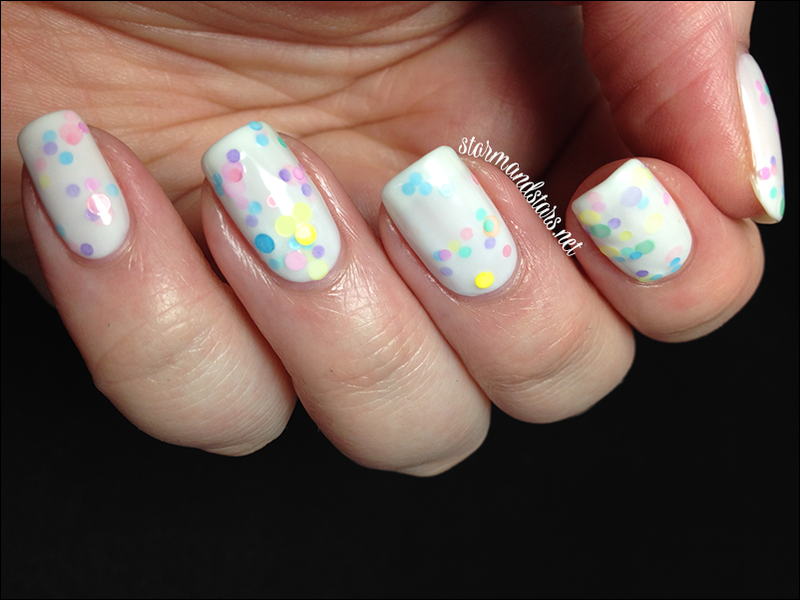 The round pastels just look so soft and the white is the perfect backdrop for them. For these swatches I layered two coats of I'm Lavender Rain using Jolie Polish White Crelly as the undies. 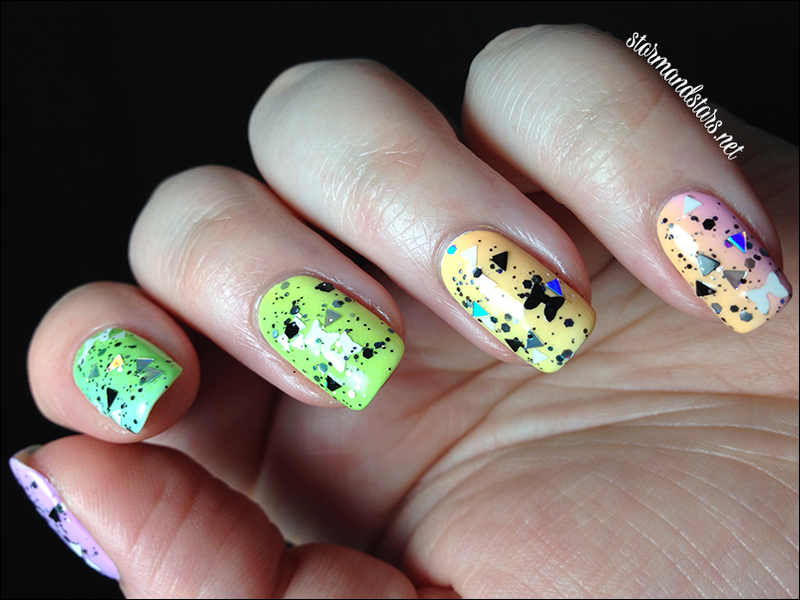 The formula was great and there is tons of glitter, so no need for glitter digging. I topped the whole thing with my favorite topcoat to smooth it out and make it shine. The other side of this duo is a very similar lacquer, Botany Plants Lately. 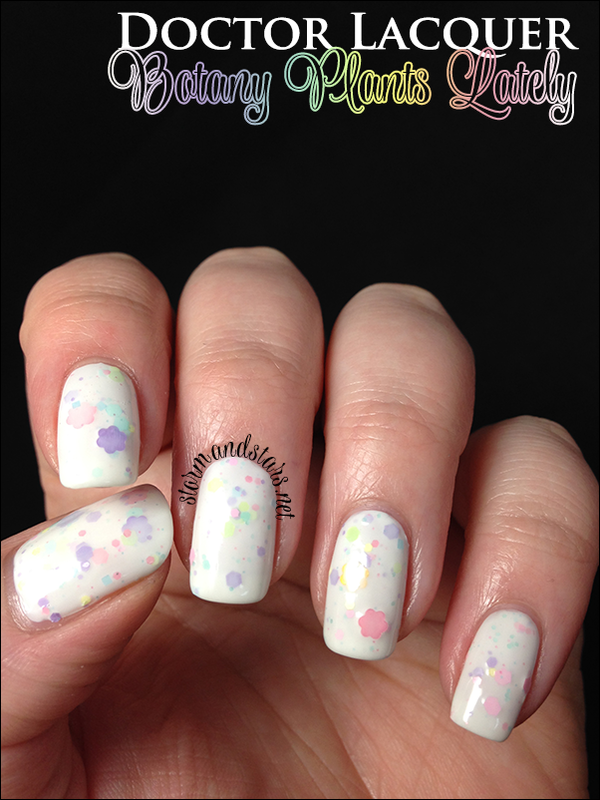 Botany Plants Lately is another white crelly based lacquer loaded with different sizes and shapes of pastel glitter including flowers. I topped off a base of Jolie Polish White Crelly with two coats of Botany Plants Lately for this look. I added a coat of my favorite topcoat to finish it off and make it shine. The formula was great again and I didn't have any trouble getting the glitter out of the bottle, including the large floral shaped ones. 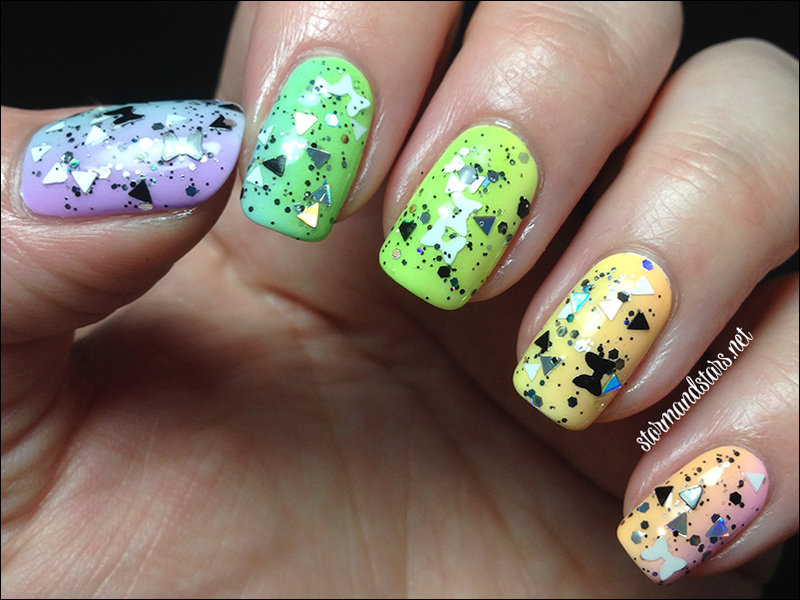 The second spring duo is the Tri Duo, two glitter toppers loaded with triangle glitters! The first is the super bright and cheery Pythagorean Fiesta. 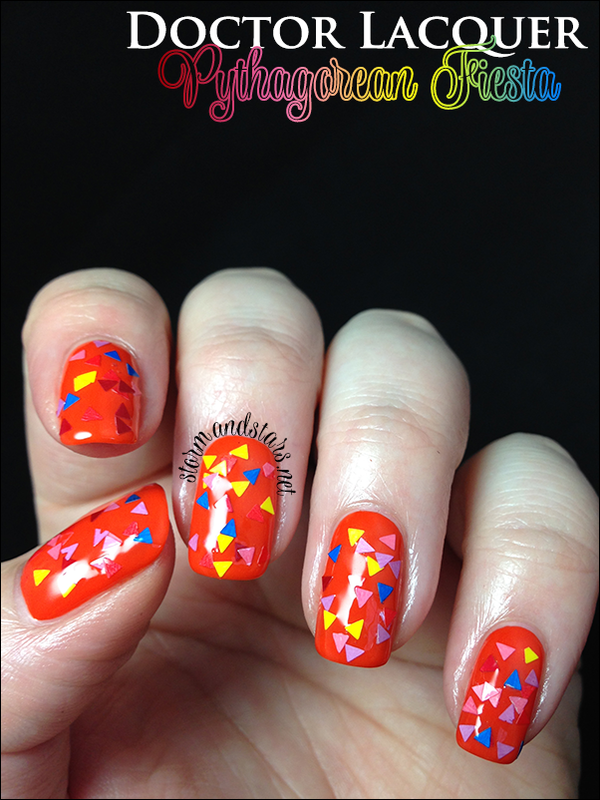 Pythagorean Fiesta is a clear base with yellow, red, pink, and blue triangles throughout. The name of this lacquer is just perfect for it. It reminds me of the triangle banners strung up at parties. 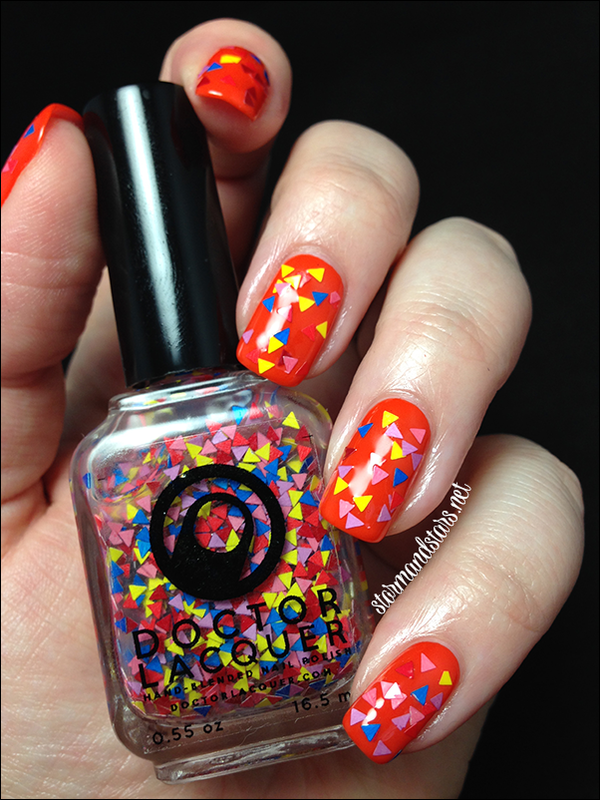 I used two coats of Pythagorean Fiesta over a base of Cult Nails Ay Poppy! for this look. The clear base was a little thick, but it wasn't really hard to work with and there is plenty of glitter to go around. I topped this with a pretty thick coat of topcoat to smooth out the points on the glitters and really make it shiny. Last, but most certainly not least, is my favorite out of these two collections. Here is Polygon Flash. 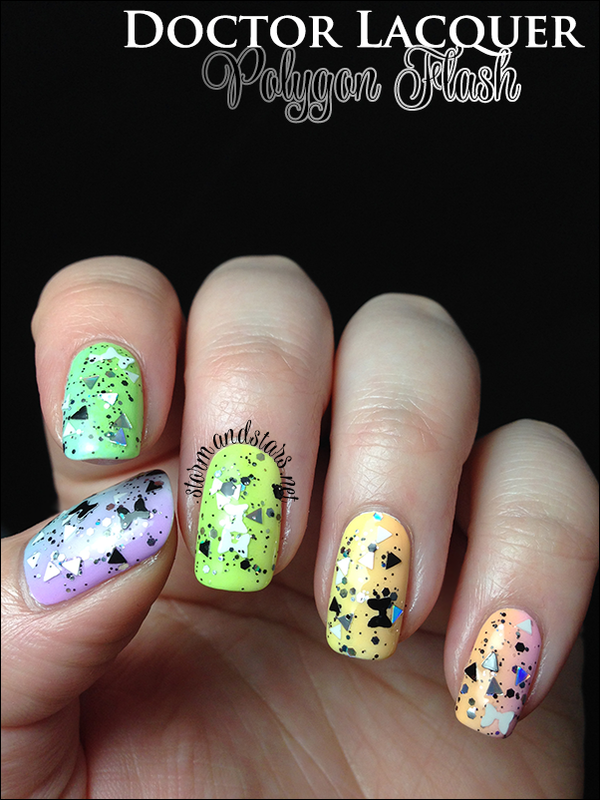 Polygon Flash is a clear base loaded with black and white triangles, butterflies and other glitters as well as silver holo triangles and hexes. You can see in some angles the flashes of color that the holo glitters make in the light. I knew I wanted something special as undies for this beautiful glitter topper so I started with a base of a gradient done with my Lime Crime collection of bright pastels. 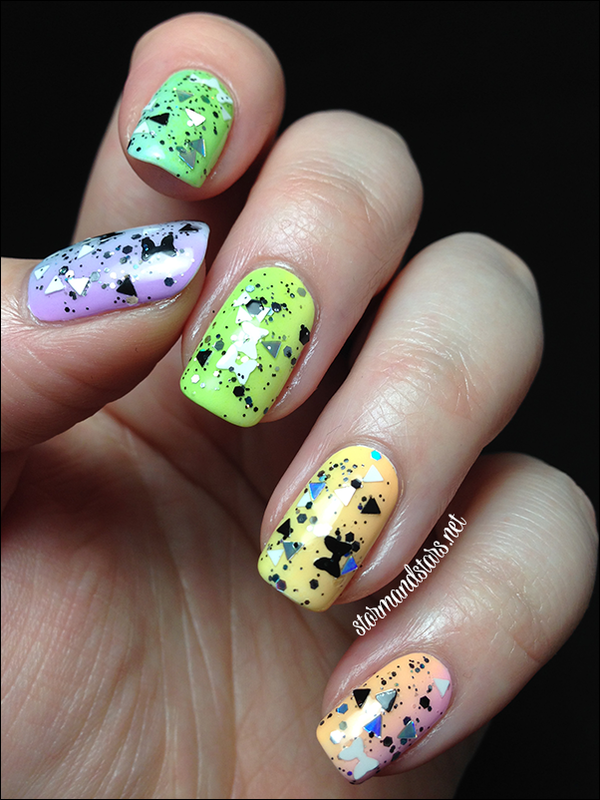 I added two coats of Polygon Flash on top of the gradient and then added a thick coat of Seche Vite to smooth it out. The formula on this was great and it is just loaded with glitters. I didn't have to dig for glitter once and I just barely had to do any placement to get the glitters where I wanted. 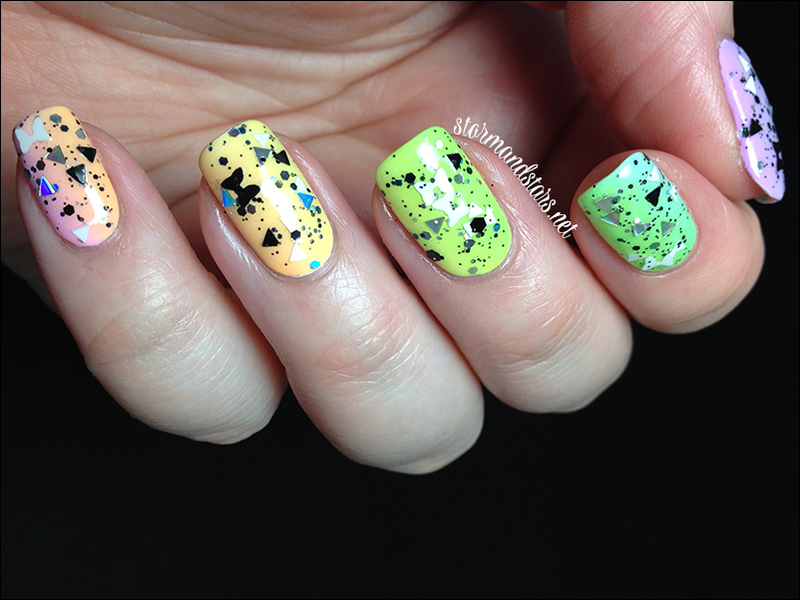 I love all four of these lacquers, which really isn't a surprise since Angelyn is a genius when it comes to polish. 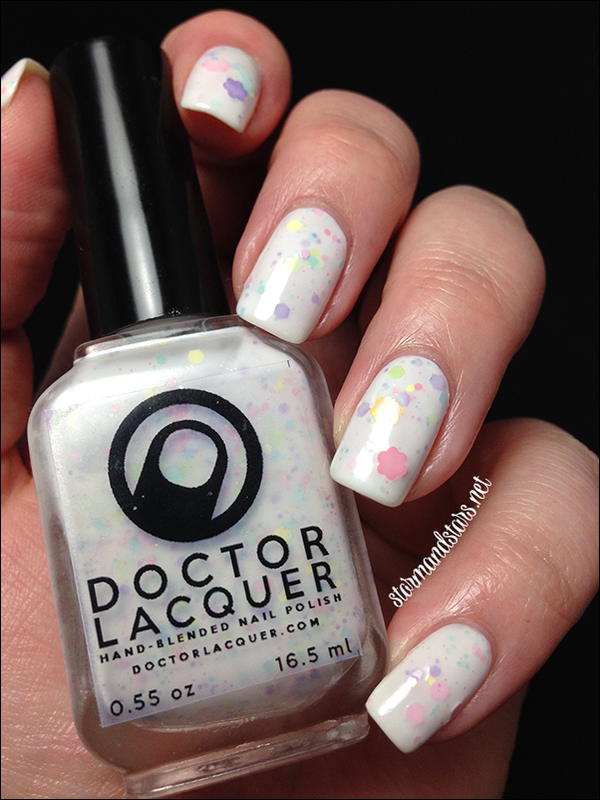 Doctor Lacquer is definitely one of my favorite brands. 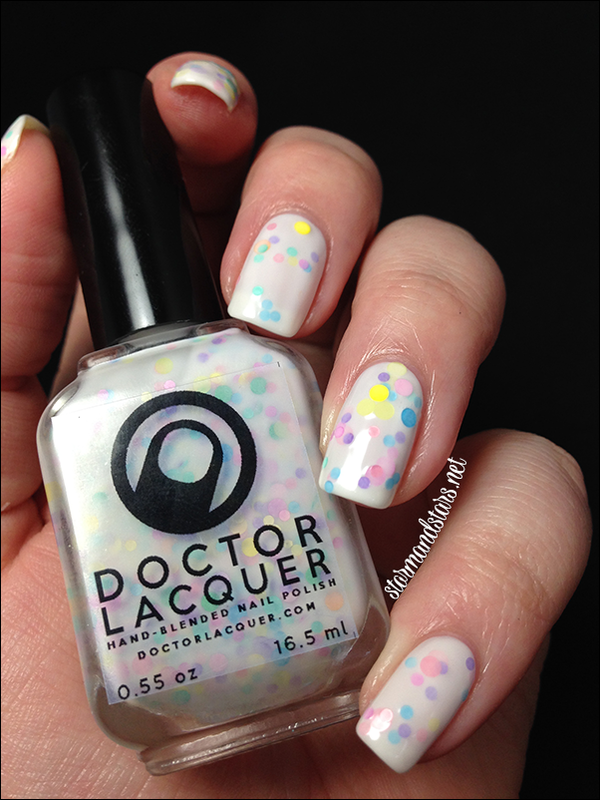 You can find these four and other Doctor Lacquer polishes in their shops either on Storenvy or Etsy. And don't forget to follow Angelyn on social media so you can keep up to date with collections, releases, sales and restocks as well as see other swatches of her lacquers! I hope you enjoyed reading about and seeing these beauties as much I loved wearing and swatching them! Great swatches and perfect gradient! 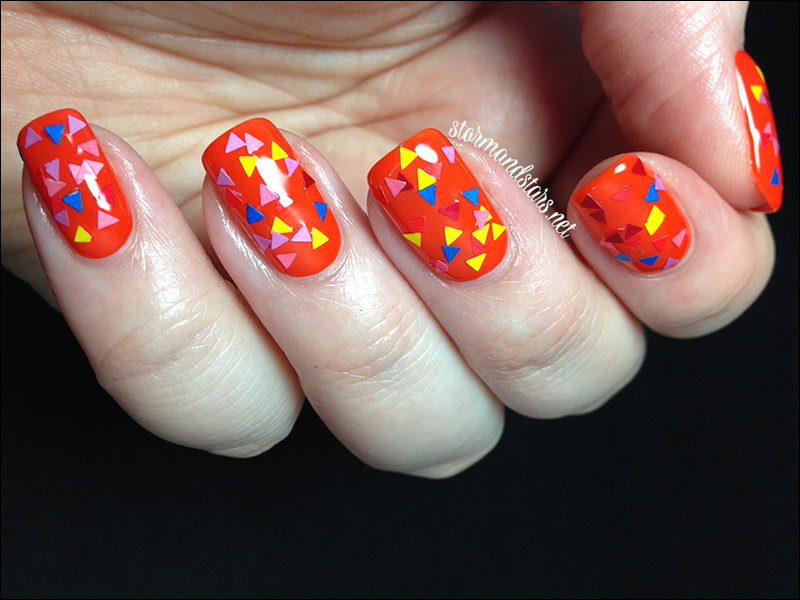 Those colorful triangles are super fun! I like Lavender Rain and Polygon Flash the most! They're so great!